Puffy Dog is a tasty and nutritious snack. A crispy outer shell with chicken, and a fresh cheese filling. A perfect choice for both tastiness and functionality. 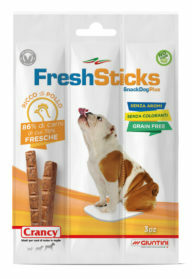 Fortified with 12 vitamins for your dog’s health and wellbeing. A carefully selected source of insoluble fibre helps to promote optimal oral hygiene. Puffy Dog can be given at any time during the day. Always allow access to fresh clean water. 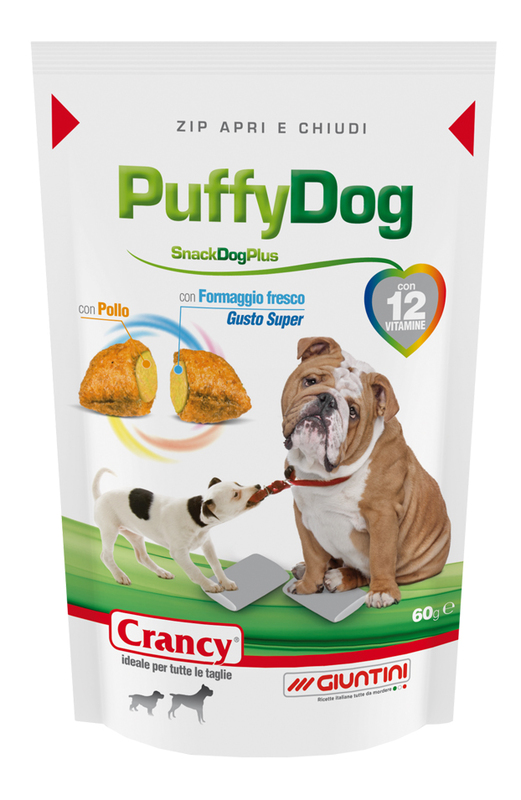 Crancy PuffyDog cannot replace a complete food for your dog. Cereals, Meat and animal derivatives (chicken min. 20%), Oils and fats, Derivatives of vegetable origin (crude fibre concentrate from natural lignocellulose 1.5%), Milk and milk derivatives (fresh cheese min. 1%), Minerals. Crude protein: 23.0%; Crude oils and fats: 13.0%; Crude fibre: 3.0%; Crude ash: 6.0%. Vitamin A: 6,500 IU/kg; Vitamin D3: 500 IU/kg; Vitamin E: 60 mg/kg; Vitamin C: 20 mg/kg; Vitamin B1: 2.1 mg/kg; Vitamin B2: 2.4 mg/kg; Vitamin B6: 1.5 mg/kg; Vitamin B12: 0.03 mg/kg; Vitamin H (Biotin): 0.03 mg/kg; Vitamin PP (Nicotinic acid): 10 mg/kg; Pantothenic acid: 4.6 mg/kg; Folic acid: 0.7 mg/kg.